Even best selling, Pulitzer Prize finalist, internationally plagiarized authors lose their writing rhythm if they drift from the craft for too long, so attested the witty and perspicacious author, Cyra McFadden, at this week’s meeting of Left Coast Writers. We were so fortunate to have her as our guest speaker. Famous for her satirical novel, The Serial, in which Marin County during the 1970’s is portrayed and poked fun at, Cyra has a keen eye and ear for memorable and meaningful characters and their lives. 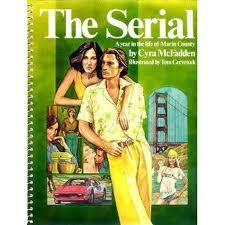 The Serial was later made into a movie staring Martin Mull and Tuesday Weld. In 1986, Cyra nearly won a Pulitzer for her second book, Rain Or Shine: A Family Memoir, in which she describes her childhood and life on the road with her Rodeo announcer father. During the 1980’s, she also wrote a biweekly column, as well as features, for the San Francisco Examiner. During many of the subsequent years however, she has been a writer interrupted. Life, with its myriad demands, has kept her from practicing the craft of writing, and she’s feeling it. To hear her, a woman with so much talent and experience, confess to having trouble getting her writing mojo back up and running, was important for me to pay attention to. All too often, I’m tempted to walk away from all this effort. Life gets busy; it gets busy with truly important episodes and events. Finding time to tap out a few lines or a few paragraphs on a regular basis is a discipline that can all to easily be sidelined. I fantasize that there will be a time when I’ll be free from all the stuff that both expands and congests my day and my thoughts. When that day comes, words will flow from me like water from a faucet. I presume that I’ll be able to jump back into my writing groove, faucet off, faucet on. But honestly, I’ve never had a faucet on experience when writing; the pipe is always somewhat clogged—drip, drip, trickle, trickle. So what makes me think that a lack of use is going to improve the situation? Hum. Even when Cyra McFadden was at her most prolific, she said her writing efforts were like “cutting stone.” What a relief! I’m not alone. I know we’re not alone in this fact, but it sure helped to hear her, a local icon, say it. Icon or not, honing sentences into meaningful and entertaining creations is seriously hard work. I don’t know if it will get easier as I go along, but Ms McFadden’s cautionary tale provided me with that little nudge to stay at it. Her talk included much more than just what she’s been experiencing lately. She read a little from The Serial, which was timeless, spot on, and hilarious. The room enthusiastically agreed that she should consider re-releasing it as an e-book, especially since bootleg versions are circulating without her consent or profit. She shared with the room stories about whole passages of her work being lifted and used by other authors as if it were their own. She talked about getting qualified advice before signing any contracts. The Serial has been sold in several languages beside English, but she hasn’t received a cent from many of those foreign editions. Ms McFadden passed around an original, out of print, spiral bound copy of The Serial so that we could see its vintage formatting and sensational hand-drawn illustrations. What a treat that was. She also donated all of the proceeds from the evening’s sales of her memoir to Left Coast Writers, which was in turn donated to a youth literacy program. Cyra McFadden was humble, honest, gracious, and exceptionally generous with her published work and life experience. For me, she’s a role model. 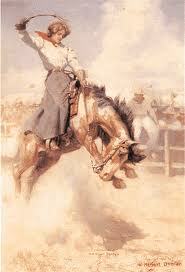 I like her style and willingness to get back up on the wildly bucking bronco called writing. As always, have a great week, and I’ll post again next Friday. This entry was posted on Friday, February 10th, 2012 at 10:16 AM	and is filed under Uncategorized. You can follow any responses to this entry through the RSS 2.0 feed. You can leave a response, or trackback from your own site. Terry Sue – It doesn’t work that way. I thought the same thing, but now that I am not working a billion other jobs, no dog to walk, kids are launched, dad passed on, home repairs caught up on – it is actually harder to write than ever. Those things gave me a framework, a structure to the day that I don’t have now. Alhough I have loved this last year of dilly-dallying around, it is high time I got back to a regular schedule of writing every day. All it takes is starting the day earlier. Do the writing first. It is the only thing that works for me. If I believe that I can write any time I want to, I won’t. Crazy. I hear you Rita. Having too much time on my hands is almost as bad as not enough. There have been days when I scheduled writing into the day-planner that I book my hairdressing clients in, just so that I get it done. Perfect summary, Terri, you made me recall everything she said, thank you. Cyra made me recognize a couple of things: there’s this thing called life that will throw me curve balls every single day. Do we forget to eat because of those curve balls? May be eat a little less or a little more. But does life prevent us from eating or breathing? And so should writing be a part of me in some form, whether a little or a lot. I think the other thing I realized also is that fame can equal humility. I’d like to hear writers say writing is not easy. There are too many accomplished writers out there who give me the impression it’s like drinking wine. If I don’t think about this in too graphic of terms, eating and breathing both involve a taking in and a releasing. Writing, in a way, is like that. I take in the world around me, swish it around a little, and then release it to the page. It’s helpful to think of writing as an equally natural process. Thanks Kalpana.